Understanding Flying Corvairs Pt. #4, Blueprint for success or? There is a myth in homebuilding that says you have to build something unique and different to be a real homebuilder. This myth is a lie; In reality, all you need to do is finish and fly a homebuilt airplane to be real homebuilder. Even if your plane is a clone of one that has be cloned 100 times, finishing and flying it makes you a real homebuilder. Conversely the most unique and original project that is never finished isn’t actually a plane at all, because planes by definition fly, and therefore, only things that have flown are eligible to be called real homebuilts. Besides the fact the plane will work just like the successful one, here is the underlying reason: If you are building planes for the right reasons, the plane isn’t the project at all. You as an individual is the actual project. The change in your skills, the expansion of your mind, the increase in your faith in yourself and your self reliance are the actual product you are working on. You can achieve all of these things building a clone of a successful plane. People who think of the plane as the product are operating at a very base level that is not self rewarding. Possession of the plane without the change in self that comes with building and successfully flying it, is empty by comparison. Ask yourself this: Three guys are ‘homebuilders’ First guy has the coolest . most unique project ever with lots of clever innovations on his builders site, he has been working on it 12 years, and it will probably never fly. Second guy finishes a more common airframe but has a something ‘innovative or unique about it, like a British car carburetor or a home brewed EFI set up. It harms the motor, and even though it goes around the pattern, the guy knows never to trust it because the world looks very different from 500’ with a sputtering engine than it does looking at a cool project on a computer screen. The third guy builds an absolute clone of a successful aircraft. It works just like the original. He flies the 40 hours off without issue. He gradually builds his skills and over time travels the country. Every bit of mastering the operation of the plane was guided by the experience of other builders who had previously built a clone of the same plane. Ask yourself, out of these three examples, which guy actually experienced the transformative power of homebuilding in his life? Every time I bring this up to a guy who wants to build something totally unique, they always counter with “but my ideas will really work.” I point out that I have known hundreds of people in 25 years who had a unique project that was never finished, and several dozen that flew a unique plane that crashed on the first flight, wasted the engine, or scared the crap out of the builder enough that he never flew the 40 hours off……and every single one of these people said to me “but my ideas will really work.” They believed this because 95% had never built a successful plane before. They didn’t know what one looked like. In the foreground above is Dan Weseman’s Wicked Cleanex. Off his wing, Chris Smith flies the Son Of Cleanex. When Chris announced his intention of building a Clone of Dan’s plane, a number of people on the Corvaircraft list gave him crap about this, claiming it wasn’t “Real homebuilding.” Chris finished the plane in 2 years, flew it for hundreds of hours, went on to flying an RV-4 that he took on trips through back country strips in Idaho and Montana, and today flies his RV-6 around the south east with his girlfriend, while he awaits the two seat Panther. Above, The five Corvair powered Zeniths that flew into Corvair College #30, all parked for a photo in front of the Mexico terminal. The engine installation on these planes are clones of the one we developed in our own 601XL more than 10 years ago. Since then, we wrote the installation manual for it, produced hundreds of installation parts like mounts, intakes and exhausts, and have taught 800 people at colleges how to clone our engines. The five planes above are a sample of the success of cloning a proven engine set up. In the story: How I became a genius in 6 minutes I share how a builder working on a unique Corvair/601 combination with an MGA carb burned up his engine on the first take off. 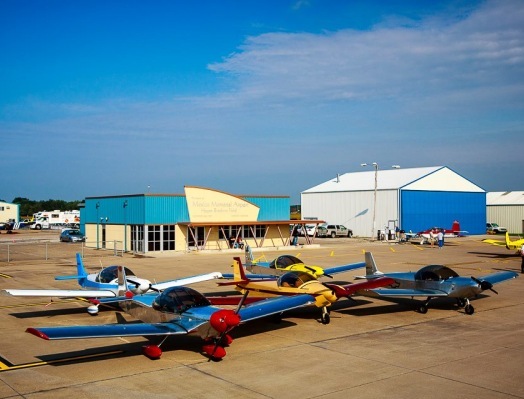 Forget about the armchair internet experts who cheered him on, and focus on this: Is your goal to be that guy with a broken engine on flight one or flying far away to places like Mexico MO and having your plane as the #6 ship in the photo? It is a fee world, take your pick. Choose wisely, some outcomes do not allow a second chance. 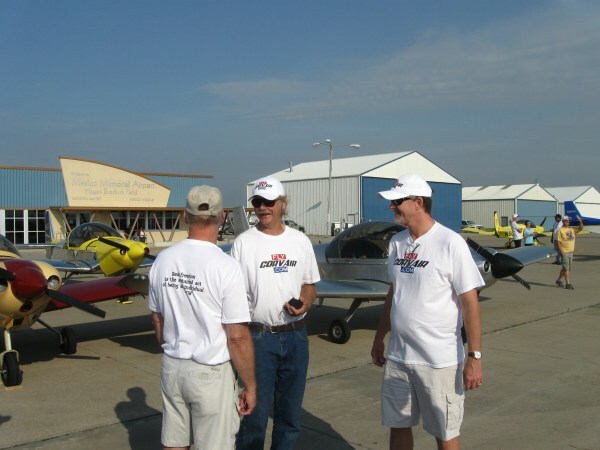 Above, a candid photo of a moment on the ramp; l-r Bob Styer, Lynn Dingfelder, and Pat Hoyt. Lynn and Pat utilized information we provide to build Corvairs that work, and they are out enjoying them. Bob is working on his own ‘clone’ of our design. I took the photo, it was a great moment in the sun, a spot every homebuilder deserves to have in his life. There is a path to get to this point, and there is also another fork in the road. Every rational person understands that choosing the other fork does not have the same track record of success. I am strongly against internet armchair experts egging on builders they will never meet to produce things with very little chance of success, but a great deal of risk. -ww. Understanding Flying Corvairs Pt. #3, My way or the highway? 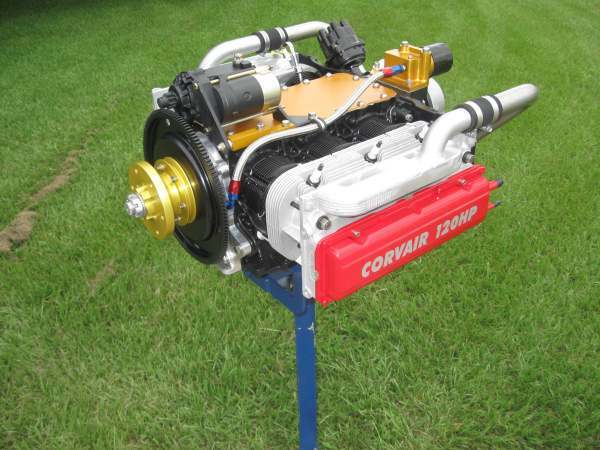 I am not suggesting that our way is the only way to build and fly Corvair engines. My position is that our way is proven, and for that reason I advocate it, and can do so in good conscience. In 25 years I have seen many examples of builders who were absolutely sure that their way would work as well or better, who ended up with a broken engine or plane. This reality is not rationally debatable. Of course there is a third position, an innovative idea that works, but stop and think, every guy with a broken plane was sure he was in this group just before he took off, and the great majority of them were wrong. In 2004 or Zenith 601XL was one of a kind, the first Corvair powered one to fly. On that day it was unique. After it was successfully flown and demonstrated, only then was there a demand for installation parts to Clone it. In the ten years since our Zenith installation has evolved in details, but essentially remains the same. It works, not circumstantially, but for a wide variety of builders in a wide variety of conditions. It is copied because it works, proven over a decade. It there were vastly better ways of doing it, they would have emerged, been proven, and in turn be cloned themselves. This has not happened. I do not have a lock on innovation, a patent on success nor even a 3 digit IQ. All I have are a first class education, 25 years of working with this engine in planes, and the experience to stare at parts for a long time in the hanger and figure out how they will fail long before the plane is taken to the runway or even started. Many people can visualize how something might work. It is my ability to visualize how it might break that took much longer to develop, and has served more homebuilders. Speaking out about these things has often lead to be being misunderstood as anti-innovation. In 1996 I wrote the words: “It isn’t the probablity of being right that counts, it is the cost of being wrong that must be considered.” I wrote it because even then I knew that most builders looking at ‘innovation’ considered that backwards. 18 years later, this has not changed. Some people read the story below and conclude I consider myself “my brothers keeper.’ I do not, I just consider him my neighbor, and if I see him about to light his house on fire, I am inclined to lean over the fence and suggest he reconsider stripping the paint with a flamethrower.-ww. Understanding Flying Corvairs Pt. #1, Intro. Here is a slightly different series, with the goal of giving builders a foundation of facts, which are the basis of all the information I provide. We present a lot of details, and a fair amount of ‘big picture’ stuff, and philosophy, but I have noticed in conversation with builders at airshows and colleges, they are often missing many fundamental ‘truths’ that my testing has long conclusively proven. Here I present a series of perhaps 20 short pieces, Each providing a block for a solid foundation of understanding. The things I say here are not up for debate. If anyone reading these says “I don’t think so’, they will do well to consider that no one has been doing this longer, tested more ideas, and seen more Corvair powered planes, and studied the results, both good and bad than I have. If someone is betting that I am wrong, understand that their wager is pretty steep: They are betting years of their time, cubic yards of money, their life, and that of their passenger. Plenty of people have been convinced I don’t know what I am speaking of, and lost this bet. In most cases they lost lots of building time, and a fair amount of capital. It often was the undoing of their building momentum and the end of their project, and an exit to homebuilding. In a handful of cases, it cost a lot more. I sincerely suggest evaluating the need, at times emotional, to believe I am wrong on this topic, and then placing one’s bet accordingly. I have plenty of these stories. A number of them involve the aircraft being destroyed on the first flight. Dragonfly, Quickie, Zenith, KR you name it, I have a story of a guy who was going to show me how wrong I was, and ended up with a broken plane in a field. Lots of them are just about people spending 8 or 10 years of their life in the shop, much of it building an engine installation I know will not work well. I had a guy call me yesterday and tell me he is going to design a gear box for the Corvair, put it on a turbo engine with 140HP heads, set it up for 200HP, and put it on a Zenith 701. He was serious. Funny, we had a guy come to Corvair College #18 with basically the same engine (not running) to make the point that I wasn’t “the only guy who knew Corvairs” He envisioned a business building these. A few months ago it was on barnstormers, never flown, asking $7,500, worth perhaps scrap metal value. Read the stories, follow the logic, adopt it into your perspective and understanding, plan your progress accordingly. The other option is to stick with an understanding based on an incorrect assumption long ago adopted, even if no evidence supports it. Take your pick, have it any way you like. -ww. About 6 months ago, a builder finished a Corvair powered 601XL and got ready to take it on it’s first flight. It should have been a low stress event, because we have almost 100 Corvair powered Zeniths that have flown, and we have proved time and time again that if you build the installation exactly how we suggest, the laws of reality insure that the plane has to work with the exact same reliability that numerous well known 601/Corvair pilots like Woody Harris, Phil Maxson and Ken Pavlou have had in their planes. No one need be a pioneer nor a test pilot, they only need to make sure the plane is in the proven configuration, and then get a test program just like the one outlined in our Flight Ops Manual. Ah that little phrase “exactly how we suggest”. Four words, 18 letters. Can’t really make that much difference can it? The builder in question had taken about 10 years to finish the plane. He was well aware of how we install a Corvair in the 601 airframe. He was a member of the Corvaircraft on line discussion group for years. Before I was banned for life from it, I spent a lot of time there writing stories trying to explain details of what we had learned by meticulous testing and evaluation. For the most part, my contribution to the discussion was not well received. I was often criticized as a damper on ‘creativity.’ In this setting, armchair experts, most of whom had never seen a Corvair fly, far less built one, applauded any effort that was not ‘conformist’ to my suggestions. I made countless posts against people who offered recommendations based on zero personal experience. It mostly fell on deaf ears. The 601 builder in question put many ‘non-conformist’ ideas into his plane. The primary one that sticks out is the selection of carb: he chose to use one of the two carbs off a 60hp 1958 British MGA. While this strikes me as a legitimate suicide attempt, his selection essentially met with cheers and applause because it went against my suggestion of using an aircraft carb. I honestly think that in a normal setting, where experience and facts are valued, the builder would not have followed through with the carb. But on Corvaircraft, there were many, many vocal supporters of crazy ideas. Their advocacy put them in no danger, they were safely at home behind a keyboard, using ‘screen names’ and making recommendations to people they would never meet. All this lead to the 601 builders arriving at two conclusions: his ideas were well thought out, and second, that guy William Wynne was probably some kind of authoritarian dim wit. Once he past 400 feet the engine went into heavy detonation, and by 240 seconds into the flight it was largely destroyed. The last two minutes were limping back to the runway. Ten years of work for 360 seconds in the air. I contacted him after the event, and we had a pretty civil exchange of thoughts. Although he didn’t say it directly, the general conversation indicated that he was amazed at how I had gone from being an authoritative dim wit to being a mechanical-philosophical genius in 6 minutes. -ww. Above, The five Corvair powered Zeniths that flew into Corvair College #30, all parked for a photo in front of the Mexico terminal. These builders decided that the surest path to their own personal goals in building and flying was to utilize the information we provide. Although I get along with all of them, their choice to use the information was based on it’s credible and proven value, not our personalities. There are also plenty of other people who, for a myriad of reasons, chose not to use the information. The great majority of those planes were never finished, and a number of the ones completed were destroyed in “accidents” . I put quote marks on that word because it may have seemed like an accident to bystanders, but I make the case that if the known expert on an installation publicly says it will not work, and the builder chooses to try it anyway, it is a misnomer to call that event an accident, as it is better described as an “inevitable.” -ww. Thought for the day: The ‘Triple crown’ of Homebuilding. I spent a lot of the day thinking about my personal “Triple Crown” of home building. This revolves around building an airframe, the engine, and knowing how to fly it with a high degree of dexterity. I had touched on this in the story: Thought for the Day: Mastery or? I don’t really know how common these goals are in homebuilding. There is plenty of evidence that people feel differently. 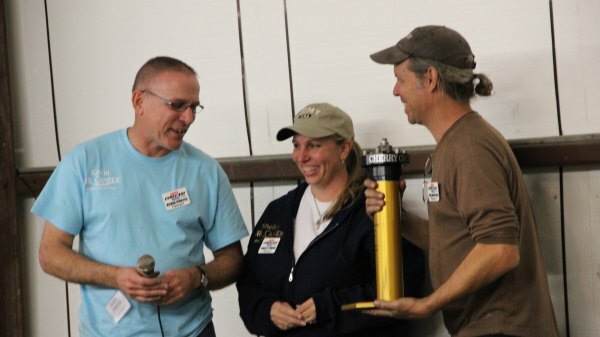 At our last EAA meeting a man brought pictures of his newly completed RV-7, complete with a $40,000 panel. One problem: word is that he can’t fly it because he is unwilling to devote the time to really learning how to land conventional geared planes. It didn’t occur to him that a $20,000 panel and a few months of regular instruction from a skilled CFI might have been a better option. Most people were wowed by the electronics and paint. It made me think about this story: Risk Management, Judgement Error, money in the wrong place. Another member flew up in the plane he has owned for 6 months.. Most people didn’t know what it was, but I pointed out it was a Luscombe 8E. Getting out the owner corrected me and gave a long diatribe about how the plane was an 8A, complete with a comment that I was too young to know classics like his. When he was done, I walked him over and showed him the data plate in the door jam, identifying the plane as an 8E. He is the owner, his name is on the paperwork, but he doesn’t even know what it is. It was another day like this one: A visit to the insane asylum. If merely owning things made people happy for any significant length of time, than Americans would be the happiest people the world has ever known. Driving around, I don’t think we are in any danger of suddenly becoming a nation of whole, self-actualized humans. 16 months ago I covered the perspective in this tale: Turtles and Cell Phones, 6/24/13. “If the goal of the captain was to preserve the ship, he would never leave port. Most people never do. The goal of the captain is to seek adventure, to meet all the challenges and still achieve the goals, to be In The Arena, not rusting at the pier in the safe harbor. Make your choice. If it sounds scary, it’s because consumer society has had decades to teach you to doubt yourself, your potential, your dreams and abilities. People who think for and have learned to trust themselves make poor compulsive consumers. Building a plane and learning to master its maintenance and flight is the rejection of these messages, and the replacement of them with the knowledge that you are the master of your own adventure. This is what building and flying is all about.” -ww. I was looking on the web for a good picture to illustrate how different Luscombe 8A’s are from 8E’s. I came across this EAA page with a great picture of an 8F…….which of course was identified as an 8A.